Sigh. In the interest of full disclosure, rumors of The Walking Dead ending Season 6 on a cliffhanger POV of Negan’s victim had been swirling for weeks now, and even a leaked audio recording of Negan’s entire arrival seemed unmistakably to end with first-person perspective of someone getting their bell rung. Even before that recording, however, the cliffhanger possibility almost immediately felt like the kind of manipulative nonsense The Walking Dead can’t seem to stop itself from pulling anymore. We should have seen it after Glenn, Denise’s out-of-place death two weeks ago, or even that ridiculous Daryl fake-out last week, but The Walking Dead is fundamentally incapable of killing off lead characters anymore, or playing by any kind of reasonable storytelling rules. Sure, someone will be dead when we pick up Season 7 in October, and I imagine producers have deliberately mapped out several possibilities, depending on contract negotiations, but why such a stain on the series, to deny its viewers that catharsis after a half-season of buildup? 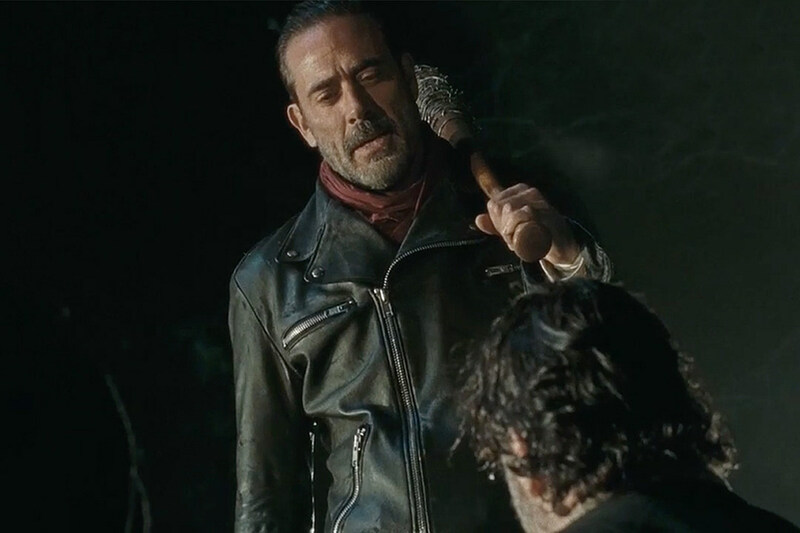 Our ability to take Jeffrey Dean Morgan’s Negan as a serious threat has all-but-evaporated along with it, as for all the pomp and circumstance of his 11-minute oration, as well the effort wearing down the audience’s comfort with repeat Savior blockades and those ominous whistles, we’ll always remember how Season 6 copped out on the iconic comic entrance. And honestly, for what? If someone died, then someone died, and there’s no reason to drag that mystery out another seven months, especially when the vast majority of fans knew at least someone would be meeting Lucille head on. Granted, if Jeffrey Dean Morgan were following his own rules, Zack Snyder probably would have killed him by now. Even then, near of the entire 90-minute runtime had been spent gearing up to that final showdown, enough to overlook that the vast majority of group screentime was spent driving from one blockade to the other, the second or third instance of which made every subsequent obstacle that much more redundant. The convention alone of getting near every character to that kneeling line-up is mindboggling, to think that Denise had to die so Maggie would be out on the road in search of a doctor, Daryl had to bumble into the various captures last week, or that tonight’s tender goodbyes with Eugene were undone minutes later by his presence at the camp. All in service of padding out the mystery for Season 7, when the Saviors could practically waltz into Alexandria right now, for all its fighters having left town unguarded. Considering Negan’s entrance went bust, “Last Day on Earth” didn’t leave very much for Morgan and Carol either, the former quickly catching up to the latter, reiterating Carol’s undeveloped reluctance to kill, and finally pushing Morgan to a place of being willing to kill for his friends. Extending the uncomfortable torture scenes, as that lone Savior finally caught up, made it particularly predictable that Carol wouldn’t actually die, only that the thread would serve to introduce us to those armored men from last week, and what they mean for Season 7. It isn’t as if Morgan crossed some great threshold either, other than to prove that some villains leave you no choice but to kill, something we’ve practically been shouting at Morgan all season. There’s going to be plenty of fan exodus and backlash after tonight, to say nothing of the think-pieces, conspiracy theories and showrunner explanations floating around in the coming weeks and months, and I wouldn’t espouse so unmanageable a threat as to say I’m done with The Walking Dead forever. They do deserve every ounce of that backlash, however, as this was a terrible, poorly-conceived mistreatment of a loyal audience, perhaps not-unironically taking a bat to viewers themselves. I have no confidence The Walking Dead will ever recover from Season 6, and that might prove the only death Sunday’s finale actually confirmed. All right, real talk: we can rule out Rick, Carl (apart from the obvious, Negan’s threats after choosing a victim rule them out), Morgan, Carol, or anyone back at Alexandria. Eugene giving away the bullet formula might make him a frontrunner, as could Abraham puffing his chest in defiance, but we’re gonna be dissecting this for awhile. Let’s hope someone lets Enid out of the closet before October! I … can barely understand what Eugene’s even saying anymore. Dial it back, guys. If nothing else, I think I’m coming around on Gabriel. Spencer’s final inquiry to Rick is another big comic setup for Season 7, by the way. Why does Carl owe the Saviors? Because they killed Denise, who saved his life? Not exactly clear. The chain gang walkers with Daryl and Michonne memorabilia were a creepy sight. Did … did they give Negan a THX entrance? Also, more than a little curious no one asked or explained that whole “I am Negan” confusion. Let us never forget that the phrase “Pee-pee pants city” was uttered on television this night.